Our sofas are chic, classy, and contemporary and are from the most renowned European brands in Italy, Spain, Germany, Norway, and The Netherlands. You have a world of options with over 2,000 shades of leather and over 400 colours of fabric to choose from. The range includes sofa set with variant configurations (two seater + 1 seater + one seater or three seater + one seater), sectional sofas (in L-shape, U-shape or J-shape), chaise lounge, loveseats, and sofa beds. Some of our iconic models have won prestigious awards such as the Red Dot Design Award and the Interior Innovation Award. Our sofas are anything but ordinary. Keeping in mind the ergonomics and functionality - our sofas have adjustable headrest, armrest, and footrest; they recline, swirl, rock, they come with built-in USB charger, an inbuilt sound system with Bluetooth, cup holders, storage space for cushions or TV remote control. Our second extensive collections are dining tables and chairs. The dining table collection includes the award-winning designs, extensible tables, available in varied shapes and sizes, with wide options of top and base materials to choose from. Chairs range from indoor to outdoor and are available in every colour under the sun. Besides, our collection comprises of recliners, home theater seating, study or office chairs, cabinets, side tables, centre tables, coffee tables, carpets, accents, crystal ware, mattress, beds, foot massagers, massage chairs, lamps, mirrors, vases, clocks, and more. To make our customers feel good and get a better experience, we have recently perked up our Mission Road showroom in Bangalore (flagship store). From the arts on the walls to the colourful chair installation like the ones you will see at a Milan Furniture Fair in Italy, to a patio with a bunch of exceptional outdoor furniture; the showroom is anything, but kitsch. Recently, the Houzz.com held their 'Open Houzz' event at the flagship store in Bangalore and the visitors were more than amazed with our extensive collection of approximately 1000 products and the overall experience spread across the 30,000 sq ft showroom. 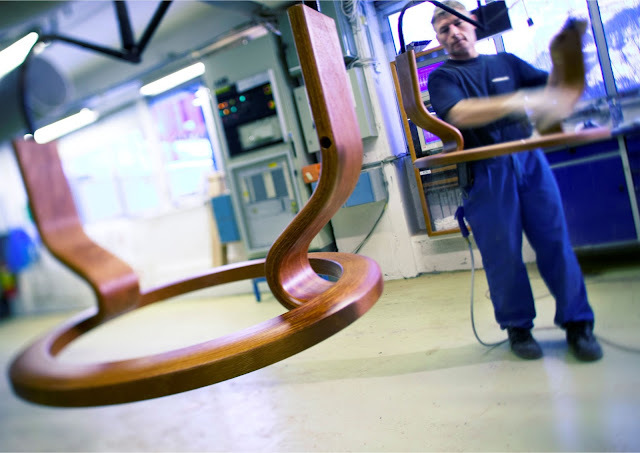 We can go on and on, but unless you drop into our stores and experience the furniture in person you can never really judge or tell how our furniture feels like. So, consider this as our personal invite. Most of us have an idea of what a perfect recliner should be. Some of us want to come back from work and sink into our recliners and enjoy the warmth and cosiness which will put all our worries away. For some, it is a pivotal part of our lives and we like to do a thing or a two, be it watching TV with a bag of french fries or reading a novel. But, if we may never bother about the spills, the cuts, and the brunt they bear over the years, we may never get them to comfort us at the end of a long, hard day. For those who are looking for a new recliner and for those who need help on deciding what recliner to buy, here's a helpful guide to buy the perfect recliner. Will it fit in the space you have? Measure the floor space allocated for the recliner as well as the width, height, and depth of the recliner before you make a purchase. Some recliners need at least three feet of space behind them to fully recline, while others take less space unless they are wall recliners. Keep in mind to take the measurement of the recliner when it is in its reclining position as well. If the recliner comes with an ottoman, reconsider the floor space needed and allot some space between the recliner and the ottoman. Choose the colour, pattern, and style you want for your decor. These three aspects will narrow down your preferences for buying the recliner. Keep the overall decor style that you are trying to achieve in mind when choosing a recliner. Click pictures of your interiors and decide which style would work best along with seating needs. 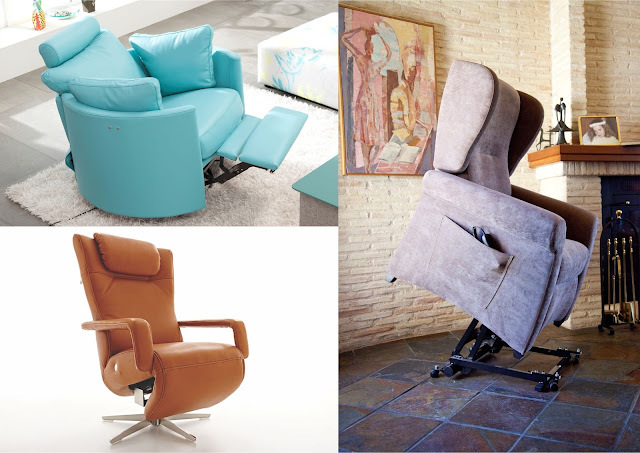 Stressless recliners come in a wide range of colours and styles; you can take a look at some of our recliners here. Recliners don't stop at colours, patterns, and style, there's functionality too. Oversized recliners, power recliners, wall recliners, lift chair, massage recliners are some of the types. Oversized recliners are perfect for large spaces or for TV or game rooms. Power recliners adjust to a comfortable posture at the touch of a button and recline at any angle you please. Wall-saver recliners are designed mainly to provide a furniture solution for rooms with a limited amount of space. Unlike other recliners, lift chairs are equipped with a powered lifting mechanism that pushes the chair up from its base to support the person (mainly for elderly people) to rise from a seated position. Massage chairs have a mechanical massage feature that supports lumbar regions and relieves aches and back pain. Decide who will be using the recliner most in your family and then ponder on which suits your circumstance the best. All the features depend on what you want or expect from your recliner. To get most of your reclining experience there are features that include rocking or gliding base just like Fama Moon recliner, massage chair, swivel base like Fama Kim, reclining all the way to a flat position like Koinor Signo, built-in USB charger, inbuilt sound system with Bluetooth, cup holders, adjustable headrest, adjustable armrest, and adjoining ottoman. 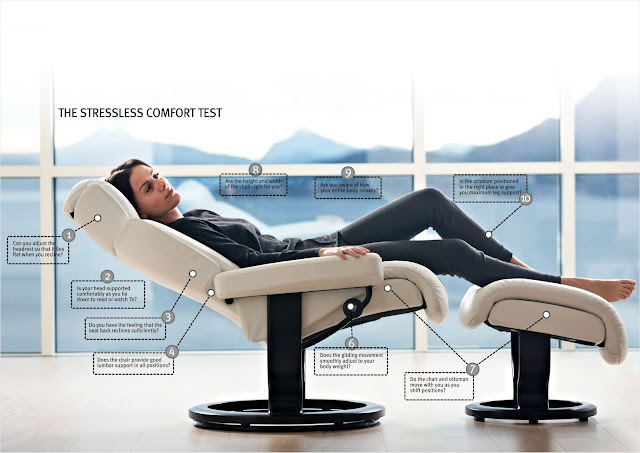 All these features add to the experience so you can relax in infinite positions for ultimate comfort. One such is the Stressless glide system which automatically adjusts to your body weight, with no buttons or levers to pull. How do you want it covered? 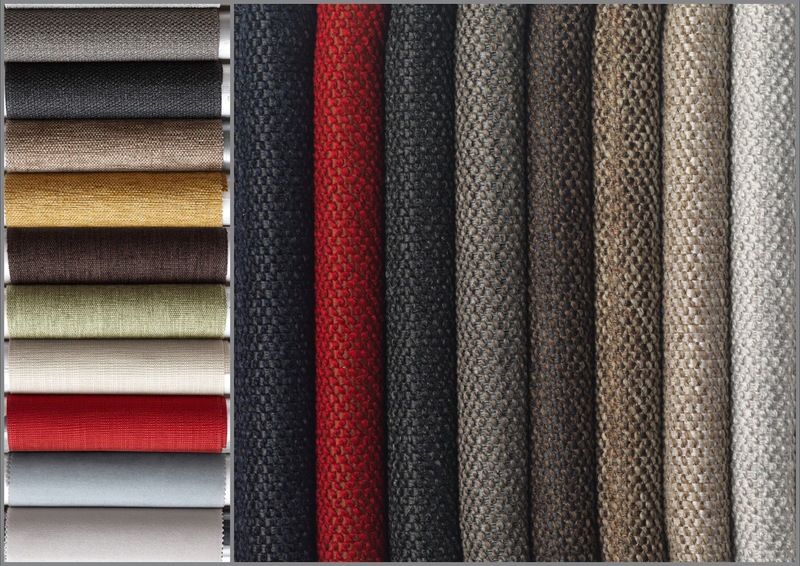 The main factors to consider while choosing upholstery is whether the material you choose matches your needs in terms of aesthetics, ease of maintenance, and durability. So go ahead and choose a fabric or a leather recliner as the upholstery options are based on personal preferences and depend on your lifestyle. For leather, Stressless and Koinor have a wide array of options and for Fabric, Fama has wide options in beautiful colours, patterns and sizes. Consider Stressless, they use only genuine top-grain leather and high-quality fabrics to cover the front and the back of the recliners. One of the biggest factors that go into the durability and price is the frame. The frame is what supports you and the other elements of the piece. The joints are the primary areas of stress on the recliner, if these are robust and can stand the test of time your recliner will last longer. The support construction is another important aspect which determines the comfort levels and durability. Other things to look for include heavy screws, quiet motors, and user-friendly buttons or levers. 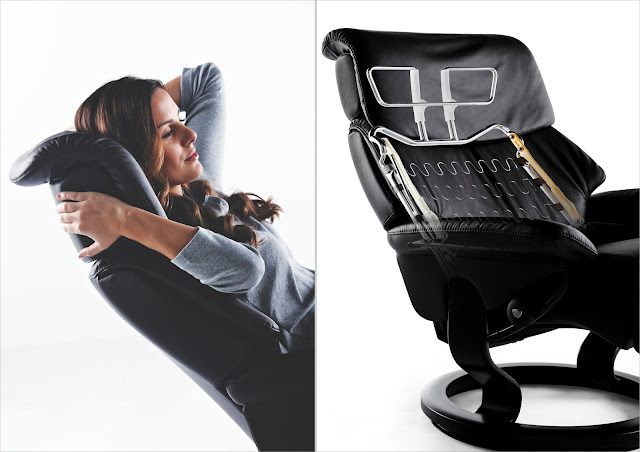 For example: Stressless recliner has flexo springs on a steel frame that ensures durable construction and strength. Also the perforated foam, moulded directly over the frame, gives you improved seating comfort since the indentations allows you to sink deeper into the seat and back of the recliner. Recliners are like shoes, looks are essential, but the right fit and comfort is the key. Is it always recommended to test the recliner before buying one. When testing, make sure to sit on it as long as you need. Your feet should touch the floor when the seat back is upright and the headrest should support the head and the neck. The thickness of the cushioning and higher foam density will ensure that it keeps its shape longer. If you do like a recliner but it isn't the right fit don't be let down, Stressless recliners come in three sizes: small, medium, and large which makes it easier for you to find the right fit. Also, if you are tall you will need an oversized recliner or a recliner that comes with a stationary ottoman. This will let you position the ottoman exactly where it needs to be to take the pressure off the backs of your legs. So sit on it, try the levers or buttons, take a spin, and see how you feel. Be your own judge, and check if the size is just right for you. 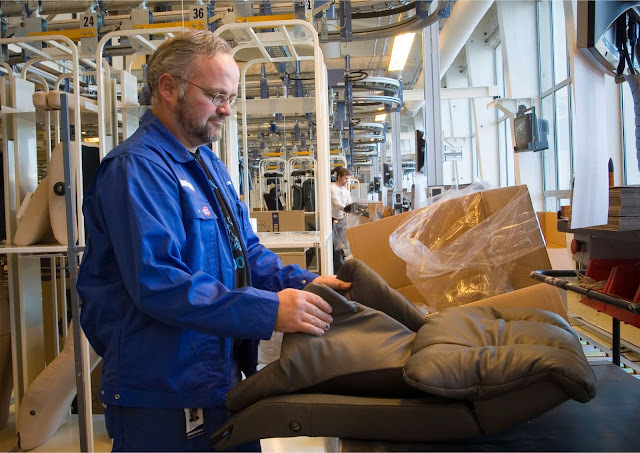 Testing the type of recliner gives you an idea of how it feels when it will rest in your living space. With today's recliner market, the choices are many but to find the one you love is quite a journey. We hope this guide will help you narrow down your selection process. We wish you good luck in finding the perfect recliner to suit your taste and décor; and if you ever want to know where to buy them there's always a Simply Sofas store where you can drop in and experience and take home the recliner you best love.